I’ve hit the jackpot! Okay well, not really. But I did discover something super exciting. I love salads, especially during the summer, and I tend to go through phases where that’s the only thing I want to eat (no, that’s not my discovery.) Unfortunately, salads just don’t taste the same at home as they do when you get them at a restaurant. You know what I mean? There’s just something about Jason’s Deli’s salad bar or a grilled House Zalad with Lite Vinaigrette dressing from Zaxby’s that just tastes so much better than throwing some lettuce in a bowl, topping it with cheese and chicken and eating it from one of your “regular” bowls at your own dining room table. Call me crazy, but you know exactly what I’m talking about. Jimmy recently introduced to me the salad bar at Native Sun (a Jacksonville gem of a supermarket where everything is organic and fresh.) Their salad bar is sort of like Subway – you tell them what you want on it and they throw it on top of the lettuce in a big bowl. Not so special, I know. After I finished picking out my veggies and toppings, they added the dressing and started stirring the mixture. 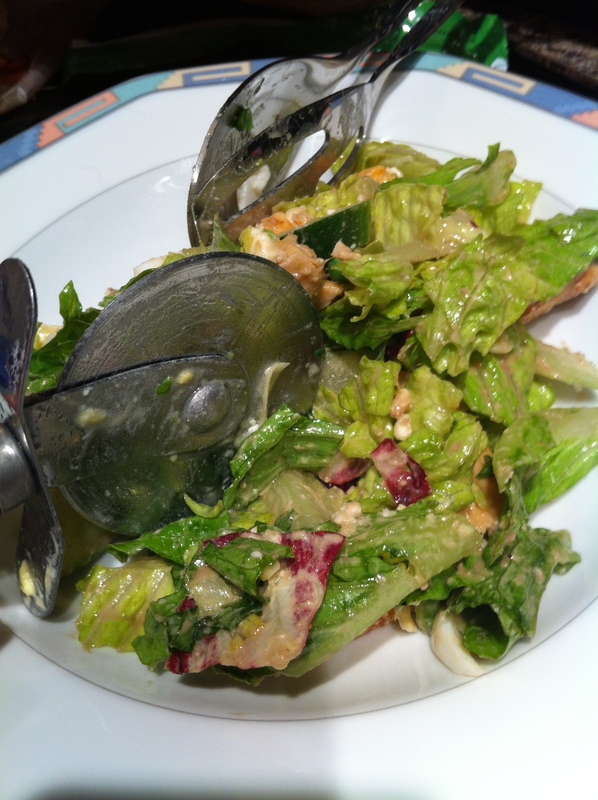 Then the amazing part happened – they started slicing and cutting the salad with a pizza slicer! Genius, right?! The salad was delicious, the lettuce was bite-sized (I love a chopped salad), and every bite had the perfect amount of dressing. 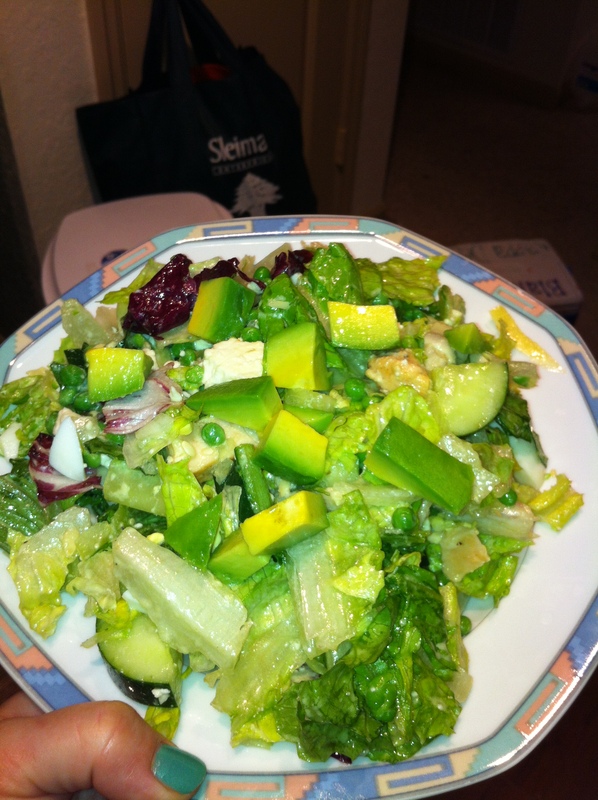 So I decided to imitate this salad on my own, hoping and praying it would be at least even half as good. And it was! The pizza slicer is seriously the most brilliant thing to use for salads! It’s the little things in life, right? It worked perfectly! You don’t have to worry about slicing and cutting all of your ingredients before adding them to your salad, and the entire salad took me literally less than five minutes to put together. Dinner in five minutes? I’ll take it! If you’re wondering what all I put in my salad and how I did it, here you go! FYI – this makes a large dinner-sized portion. Put the lettuce in a large mixing bowl. 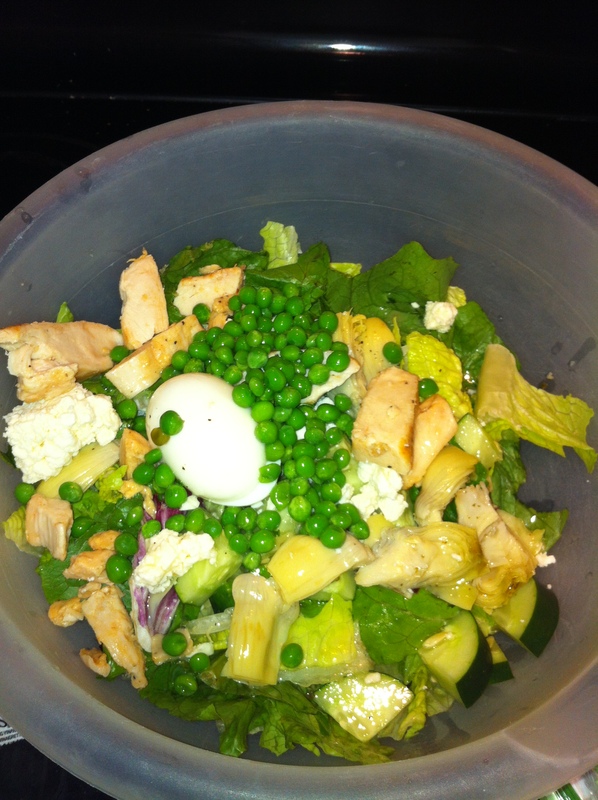 Add the artichoke hearts, peas, cucumbers, cheese, egg, meat and dressing. With a large wooden spoon, gently stir and toss the salad. 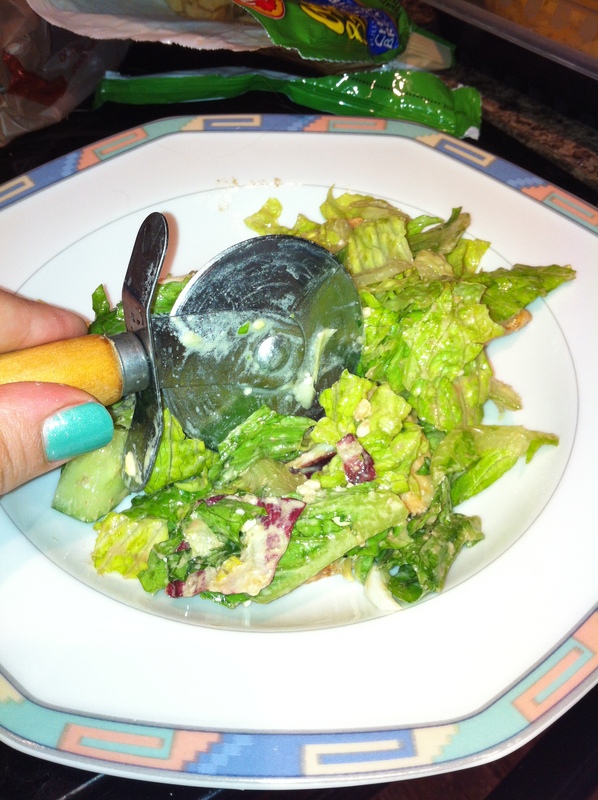 With a pizza slicer, start slicing and cutting through the salad mixture. Do this until everything is cut to your preference and all ingredients are mixed together. Transfer into a large serving bowl. Top with the sliced avocado and sprinkle lightly with salt and pepper. Enjoy! Be creative with your salad! Try adding corn, carrots, broccoli, zucchini or green peppers – all would make a delicious addition to any salad. If you have any yummy salad recipes, tips or tricks, please share!